A sign posted outside the National Archives Museum that informs the public that the facility is closed due to the government shutdown. Today marks day 22 of the 2018-2019 government shutdown—making it the longest federal shutdown in American history. While much has been said about the way that it’s impacted airports and national parks, relatively little has been said about the way it’s affecting museums. 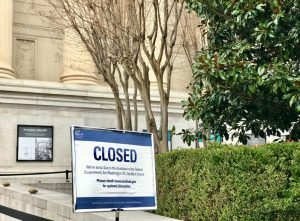 The National Archives Museum in Washington, D.C., for example, is closed. As a result, thousands of would-be visitors are missing out on the opportunity to view historic documents like the Declaration of Independence, the Constitution, and the Bill of Rights. But the National Archives Museum isn’t alone; other government-funded museums were forced to close their doors, too. The iconic Smithsonian institutions in Washington and New York are also closed. St. Thomas said that all 19 museums—which include the National History Museum, the African Art Museum, and the Portrait Gallery—draw an estimated 1 million visitors per month. That’s a lot of people that are being denied access to these instutions, and art enthusiasts aren’t happy about it. “This administration has made it clear through budget cuts and ignorant tweets that the arts and cultural education are of little value or importance,” said Los Angeles-based artist and writer Whitney Bell, who founded a talk series called The Stories Of Women. “Hundreds of thousands of jobs furloughed and millions of Americans left without access to our most important cultural institutions, historic landmarks and influential art, and for what?” she pondered.